Billy Twelvetrees is a versatile back, who can play at both fly-half and at inside centre, who possesses the ability to cross the tryline while guiding his side home with the boot. Twelvetrees - whose nickname is '36' following Geordan Murphy's assertion that 12 threes are 36 - has seen his reputation rocket after a successful season with Bedford during the 2008-09 season where he scored 18 tries for the Championship side. He re-joined Leicester in time for the 2009-10 season and took his bow for the Premiership side in October 2009 as a replacement for Dan Hipkiss in a Heineken Cup match. And after sitting out much of the season with injury, Twelvetrees managed to get more game time under his belt during the 2010-11 season with the likes of Toby Flood, Jeremy Staunton and George Ford all injured at various moments throughout the campaign. After an impressive season, Twelvetrees found himself in the England Saxons frame for the 2011 Churchill Cup. 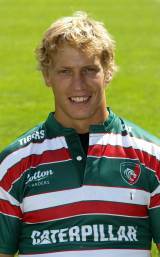 And with the likes of Flood on international duty at the 2011 World Cup, Twelvetrees relished the chance to shine for the Tigers in the 2011-12 season where he scored an incredible 29 points on two occasions against Wasps. In January 2012 Twelvetrees, who was called up for England Saxons' to face Irish Wolfhounds at the same timie, agreed to join Gloucester for the following season as he looked to boost his international prospects. That decision paid dividends as Twelvetrees earned a call up to the England squad ahead of the 2013 Six Nations after consistently impressing for his new side.